North Korean leader Kim Jong-un is expected to reaffirm his denuclearization commitment and call for the sincere implementation of June's summit agreement with US President Donald Trump when he delivers his New Year's Day address next week, experts said Tuesday. Kim has used the annual Jan. 1 speech to outline key policy goals and directions for the new year. The in-person address is closely watched by the outside world for hints about where Kim is going to take the North on key issues, such as the standoff over its nuclear program. This year's address comes as the denuclearization negotiations between the North and the United States remain in a stalemate, with Pyongyang demanding sanctions relief and Washington insisting on maintaining sanctions until the North takes further denuclearization measures. 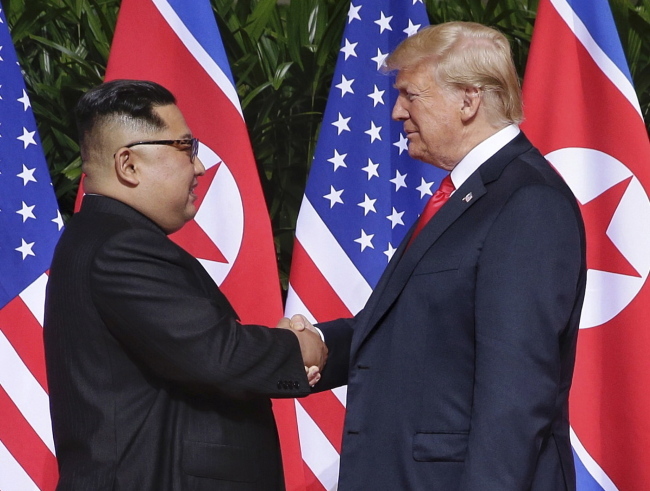 "While reaffirming his commitment to denuclearization, Chairman Kim is expected to stress the principle of simultaneous actions ... and call for the implementation of the agreement reached at the June 12 summit with the US," said Kim Yeon-chul, chief of the Seoul-based state-run Korea Institute for National Unification think tank. In recent weeks, the North has increasingly expressed frustrations about the US unwillingness to relax sanctions, with a foreign ministry-affiliated think tank warning that if Washington sticks to sanctions, it will "block the path to denuclearization on the Korean Peninsula forever." Though Pyongyang's official Korean Central News Agency, as well as other state media and propaganda outlets, have made such criticism, the North's government, like the foreign ministry, has not made such a statement yet, an apparent indication that the country doesn't want to break off the nuclear negotiations with the US. Last week, the Choson Sinbo, a pro-Pyongyang newspaper in Japan, whose articles are believed to reflect Pyongyang's stances, said that the North's denuclearization commitment will remain unchanged because leader Kim committed to the goal. "Even if big powers' interests sharply clash and the international situation is swayed by strong waves, there will be no reversal of the new historic flow that started from Panmunjom," the newspaper said. "This is because our supreme leader, who accomplished the great task of completing the national nuclear armament, made a decision on complete denuclearization." In what appeared to be a goodwill gesture toward Pyongyang, the US has also expressed a willingness to allow American citizens to travel to North Korea for aid delivery, a move that could serve as a face-saving way out of the impasse. With regard to relations with South Korea, Kim is expected to call for the sincere implementation of the agreements reached in three rounds of summit talks with President Moon Jae-in, rather than making new proposals or initiatives. Domestically, Kim is also expected to use the address to call for economic development.